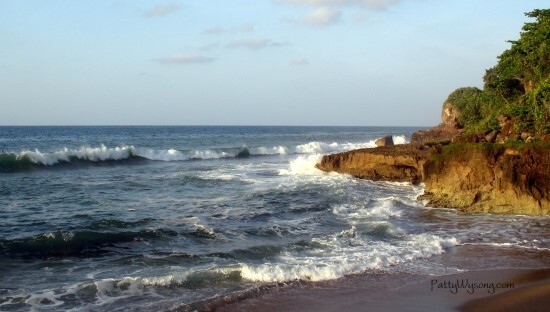 A sheltered cove in Puerto Rico. 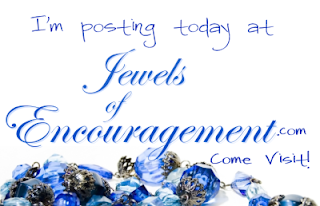 I'd love to have you join me today at Jewels of Encouragement with Rocky Times. This week is the letter M.
Really, I DID plan on doing a post on something other than monkeys for the letter M, but... oh well. I'll do it later. 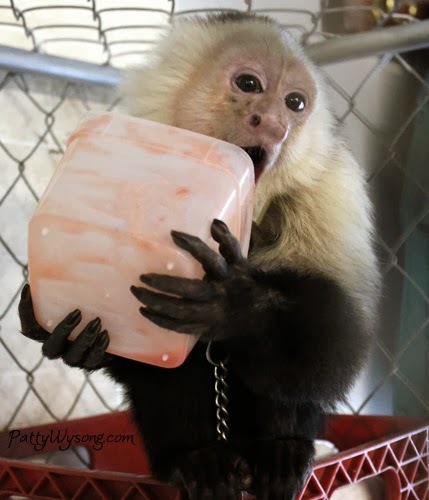 Monkeys love strawberry jam. And I do mean LOVE. Giving them the almost empty box of homemade strawberry freezer jam is as much for our entertainment as their enjoyment. 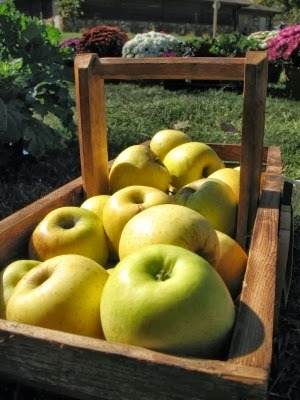 Before the box is licked clean, they'll almost stand on their heads to get it all. 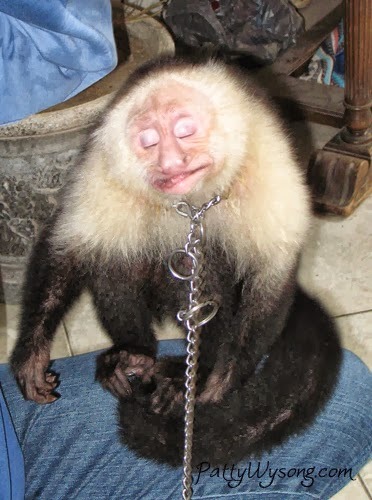 Getting pictures of monkeys is not as easy as you may think. We had to upgrade our camera to have a high speed clicker. It often takes up to 10 shots to get a decent picture. Toby is a goof, but he's even goofier in some of the pictures I end up with of him. 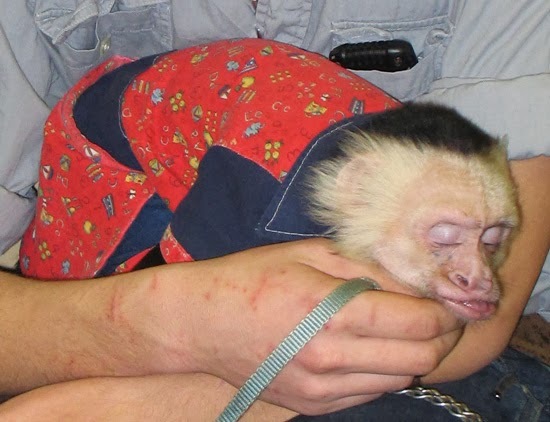 Since we exhibit the monkeys, they get to see their vet on a regular basis. When they're working, they see him twice a month. 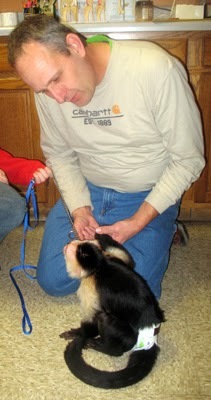 I am so very thankful for our vet Carey. 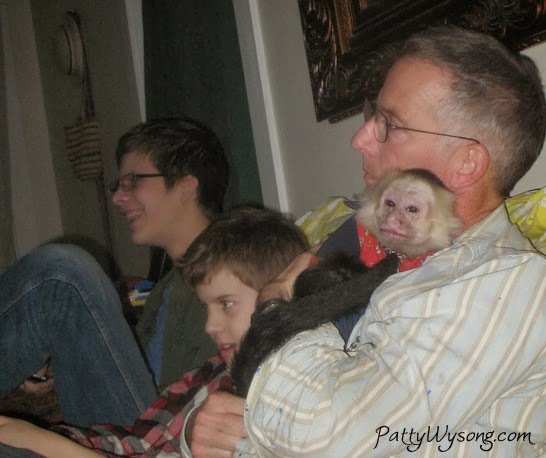 He's phenomenal with animals, and isn't put out by over excited monkeys. Not only that, but the vet's office staff is great. Fonzie doesn't do well with dogs, so when there's dogs in the waiting room, the ladies point us to an exam room to wait in so Fonzie doesn't freak out and terrorize the dogs. 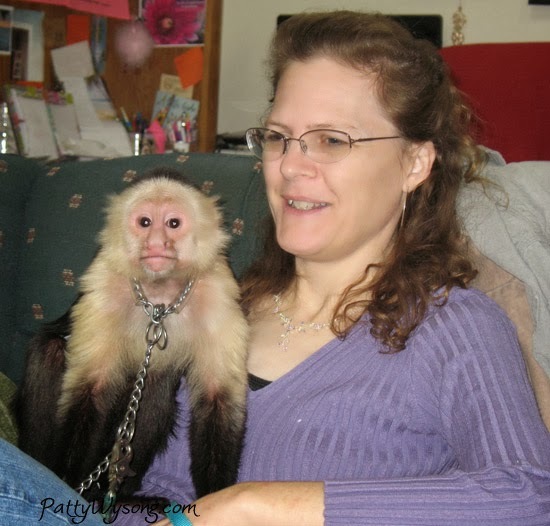 So tell me, if you could have an exotic pet, what would you have? If you're joining us for the A to Z meme by posting on your blog this week about the letter M, be sure to add your name and the link to that particular post in the linky gadget here. Also, if you don't have the linky gadget on your site, click the link to get the code so you can add it. 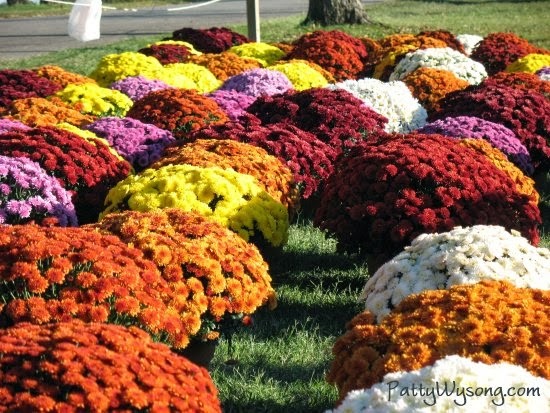 This week is the letter L.
First, never, and I do mean NEVER, plan to post about life in a lull season. Why? Because Life will hear and go bonkers on you. Very rarely do I get to stay in a routine--it just doesn't happen for me due to the nature of our lives. And that's okay--it makes me appreciate it that much more when I do. Lately I've been tiptoeing through this lull in my life, knowing it was just a temporary thing. I've soaked in the moments of quiet and even solitude--not even visiting Facebook or my blog here. It's been a time of recharging and enjoying. I've gotten things done in my home, dug into my Bible study, had fun with my fiction writing, and taken great strides with Toby. It's been wonderful. I love living a quiet life. But I suspect my lull has come to an end. It's been good, though. So tell me, what have YOU been doing lately? If you're joining us for the A to Z meme by posting on your blog this week about the letter L, be sure to add your name and the link to that particular post in the linky gadget here. Also, if you don't have the linky gadget on your site, click the link to get the code so you can add it. This week is the letter K.
Kookaburra often gets stuck in my head. And it's annoying as all get-out. I do not like Kookaburra!! So I try to kick him out. Thinking about God's kindness to me...to us...helps kick Kookaburra. 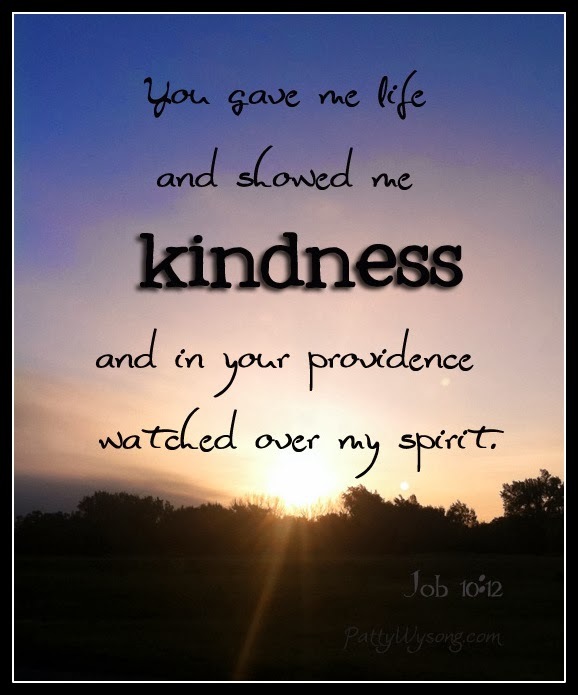 I'm so thankful for God's kindness to me. 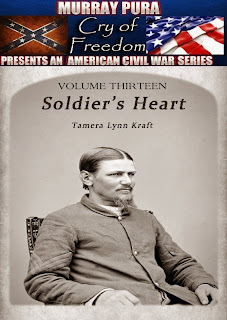 Be sure to check out Soldier's Heart by Tamera Lynn Kraft and leave her some kindness. 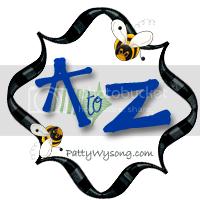 If you're joining us for the A to Z meme by posting on your blog this week about the letter K, be sure to add your name and the link to that particular post in the linky gadget here. Also, if you don't have the linky gadget on your site, click the link to get the code so you can add it. Soldier’s Heart is available in e-book from Amazon Kindle, Kobo Reader, and Barnes & Noble Nook. It will also be available in paperback in a couple of months. Tamera Lynn Kraft has always loved adventures. She loves to write historical fiction because there are so many stories in history. Tamera has recently celebrated her thirty-fourth anniversary with her loving husband. 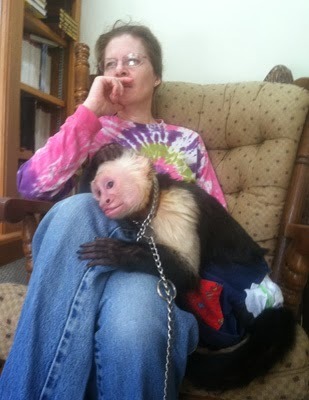 She has two grown and married children and two grandchildren. Tamera has been a children’s pastor for over 20 years. She is the leader of a ministry called Revival Fire For Kids where she mentors other children’s leaders, teaches workshops, and is a children’s ministry consultant and children’s evangelist. She is also a writer and has curriculum published including Kid Konnection 5: Kids Entering the Presence of God published by Pathway Press. She is a recipient of the 2007 National Children’s Leaders Association Shepherd’s Cup for lifetime achievement in children’s ministry. Word Sharpeners Blog: http://tameralynnkraft.com and on Facebook: and Twitter. Tamera Lynn Kraft has crafted a well-researched tale about the residuals of war and the lessons of patience for husbands and wives. Well done! ~ Mary Ellis, author of A Heart Divided. KW: Tell us a little bit about the two main characters in Soldier's Heart. TLK: Sergeant Noah Andrews is a soldier from the Ohio Seventh Regiment, one of the most heroic regiments from the Union Army. Because he signed up for a three year enlistment when the war began, he came home before the war ended. During the last battle, he suffered the loss of his entire squad. Now that’s he’s home in his small town of Ravenna, Ohio, he’s suffering from PTSD, called Soldier’s Heart back then. He loves his wife and is glad to be home, but he’s having a hard time putting the war behind him. Molly Andrews has always been in love with Noah. That’s why she married him as soon as she turned sixteen years old. It didn’t matter that he would be going to war the next day. She knew their love would be enough. She struggled during the years he was away, worrying about him and keeping the farm going. But she knew that as soon as he got home, everything would be better. She wasn’t prepared to handle his bout with soldier’s heart. KW: What is the setting and time frame for your book? TLK: The setting is Ravenna, a small town in Northeast Ohio that still exists today. I grew up in Ravenna and had fun researching the history. Many of the downtown buildings of that time period are still standing today. The time frame is July, 1864 when the Ohio 7th comes home. The war is still going on, but Sherman’s march to the sea is in progress and it’s only a matter of time before the South surrenders. KW: What gave the idea to write this particular book? TLK: I wrote another novel about the Ohio Seventh and was fascinated by that regiment. When the publisher wanted me to write a novel set in 1864, I thought about what is was like for the men from that regiment, who had fought many major battles and suffered its greatest losses in the last battle, to come home before the war was over. I started researching PTSD from that time period, and it all came together. When deciding what town to set the story in, I thought it might be fun to research the town I grew up in since some of the men from the Seventh came from there. 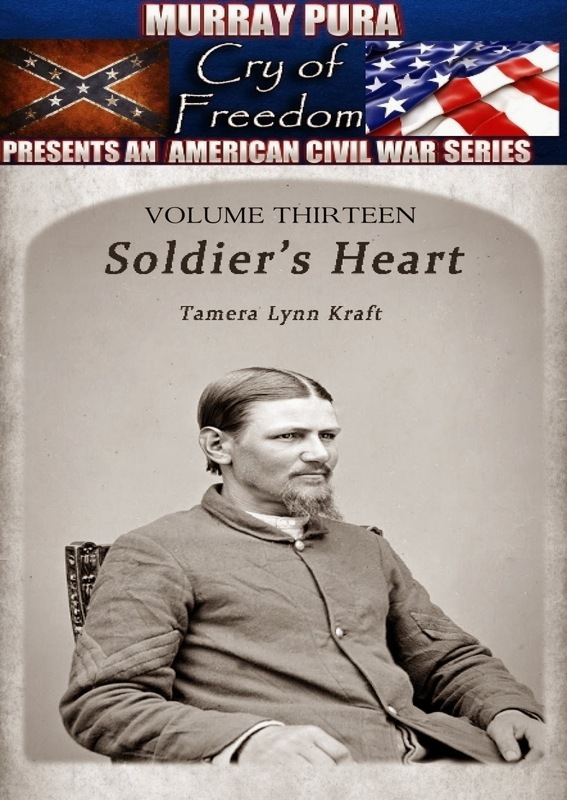 KW: Soldier's Heart is about a young man returning from the Civil War. It reminded me somewhat of the 1946 movie, "The Best Years of Our Lives." What can families and friends do to help soldiers return to everyday life after returning from a war front? TLK: “The Best Years of Our Lives” is one of my favorite classic movies. I’ll never forget that haunting scene when the man who lost his arms has his girlfriend help him get ready for bed. I think one of the best things family and friends can do to help soldiers return to everyday life is to be patient. Let them reenter at their own pace. Don’t expect them to get over it right away. They need time and prayers. KW: What can a church do to show grace and mercy to a returning soldier and his family? TLK: That’s a good question. In Soldier’s Heart, Noah’s pastor helps him get through PTSD by counseling him about his thought life. I think spiritual counseling is something that is needed with a returning soldiers and their families. Of course, prayer and showing the love of Christ is also very important. I think one thing that is needed that is lacking is patience. Sometimes God miraculously heals, but most of the time, it takes a while. Be sure to stop by Karen Wingate's blog, Grace on Parade, to see how God's grace is portrayed in Soldier's Heart. Personally, I like reading light, fluffy books--romances that are tied all nice and pretty at the end with a bow. I'm an escapist at heart. Although Soldier's Heart is not my usual fare, it's very good and worth reading, with just enough romance to keep me happy. My heart ached for Noah and Molly and I came to understand a little more about PTSD and those who live with it. 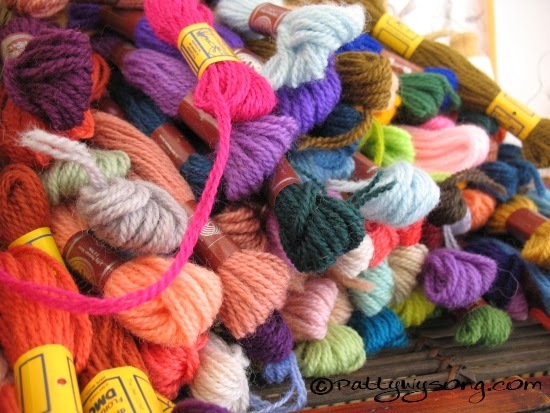 Kraft pulled me into the story with her characters and kept me reading. It's a novella I recommend. Don't forget to pick up a copy from Amazon Kindle!